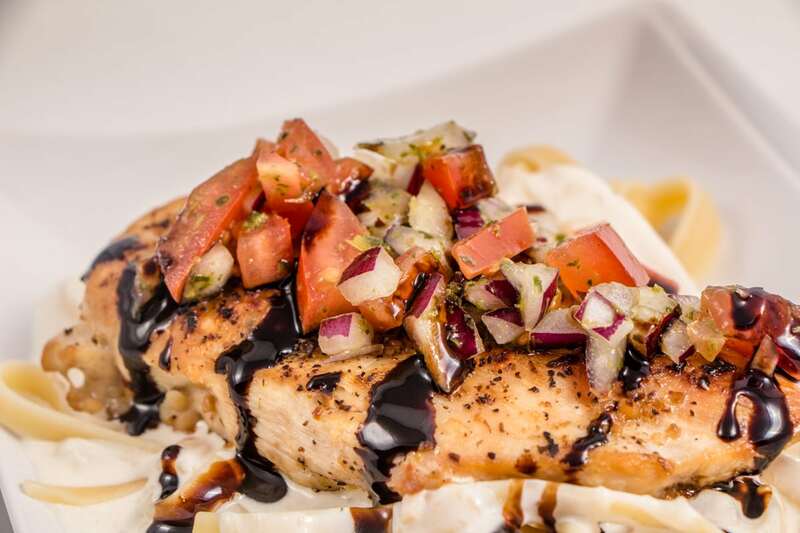 I first tried Bruschetta Chicken with Deglaze Balsamic Vinegar before my recent trip to Italy. I was hooked instantly. The melding of flavors in the bruschetta on top of a perfectly season chicken breast were wonderful. Then you add some Deglaze Balsamic Vinegar and you will be in love as quickly as I was..haha…but really. The Bruschetta Chicken is wonderful and even my boys ask for it over and over as they love the flavors. There was a time in my life when I was fearful of recipes that looked “fancy”. 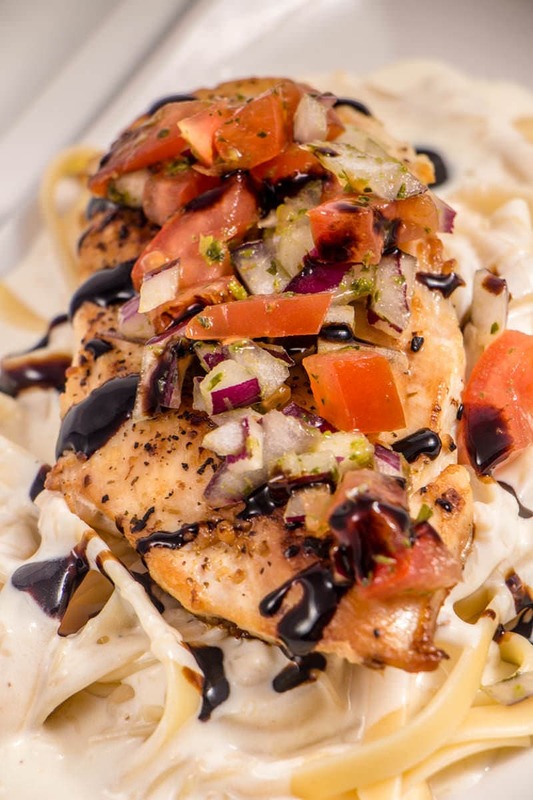 The Bruschetta Chicken is so easy, you can wow your friends or family with this dish. It whips up easily. You can quickly dice up the Roma Tomatoes and red onion into a bowl and add basil. In the summer I love fresh basil, however it’s just not always available, so I go for the next best thing. Either basil paste or frozen cubes from Trader Joes. Oh how I love that place. 🙂 Regardless what you use, you won’t be disappointed. 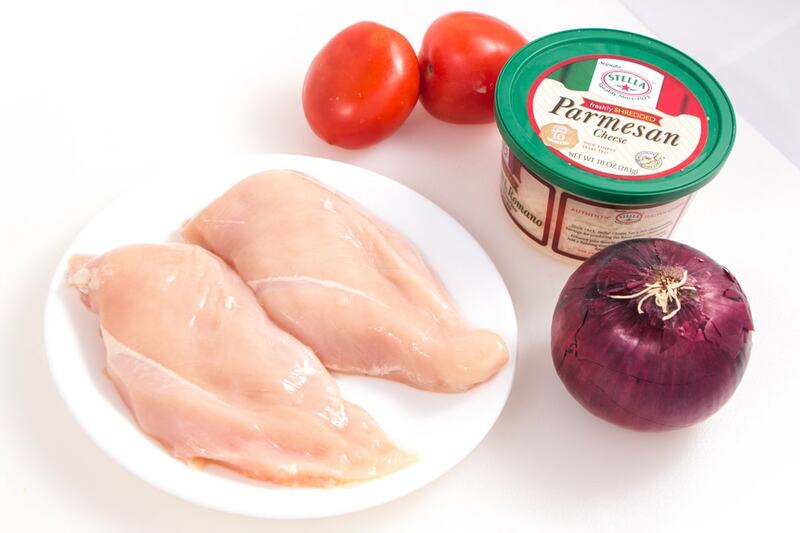 Mix it together and let it sit for the flavors to meld together while you cook your chicken. Cooking chicken breasts is easy. Salt and Pepper your breasts to taste and throw them into a hot frying pan with some olive oil. Allow them to cook on one side for 6-8 minutes. I cook at a medium high temperature and depending on how thick the breasts are will determine the length of time. Then flip and cook an additional 6-8 minutes on the other side. Your chicken needs to reach an internal temperature of 165F degrees to be cooked all the way through. Raw chicken is bad news. So make sure you cook it all the way. Once the chicken is cooked, I plate the chicken and add the bruschetta. Don’t forget to top it all off with some parmesan and some deglaze balsamic vinegar. It’s wonderful. You can make your own glaze, it’s super easy or you can buy it from the store. Again, I love Trader Joe’s for this item. It’s sweet with that balsamic twang. Yummy! Stores easily in your refrigerator and is perfect for whenever you need it. I’d love to hear how much you like this recipe. Comment below and let us know! Try these other mouthwatering recipes! 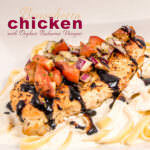 The flavors combined to make a mouth watering exploding of goodness in this Bruschetta Chicken Recipe. Wash tomatoes and dice and place in a bowl. Dice Red Onion and place in bowl with tomatoes. Add basil and stir to combine. Set aside. In a large frying pan over medium high head, place olive oil and allow to get hot. Place chicken breasts in oil and salt and pepper to taste. Cook for 6-8 minutes per side. Chicken should reach an internal temperature of 165F. Remove from heat. Plate with Bruschetta topping and parmesan cheese. Drizzle Deglaze Balsamic Vinegar on top. I’ve never had bruschetta chicken before, but it looks delicious! 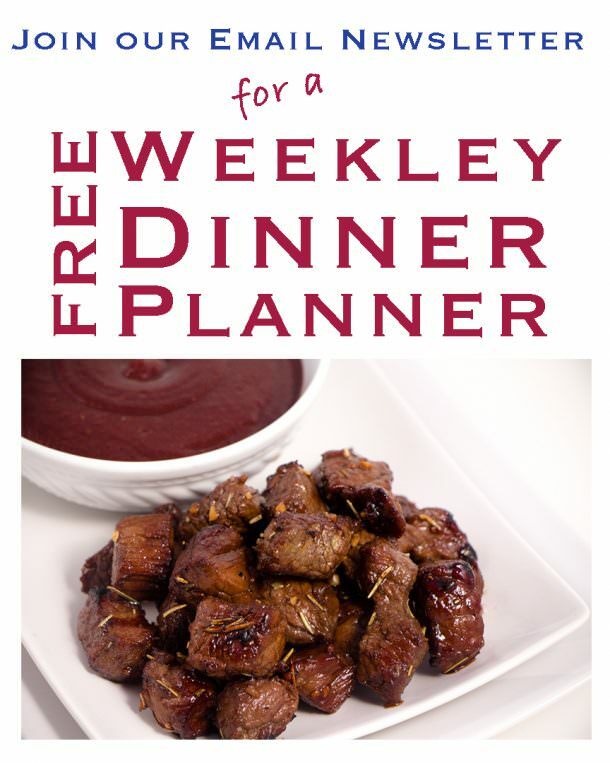 I’m definitely adding this to next weeks meal plan! Wow! as a chicken lover I surely will check this recipe and buy all the neccessary ingredients. Thanks to you I learn something new today! It reminds me of “Adobo” I love balsamic vinegar and I used it cooking adobo as well. It looks luscious! This looks absolutely delicious! I do not think I have actually ever tried this. The cook and prep time doesn’t look like it takes much time, which I appreciate. I will have to try this recipe, thank you for sharing! I have no idea how a chicken dish can sound so good! This looks so delicious. I will have to make this for my family really soon. 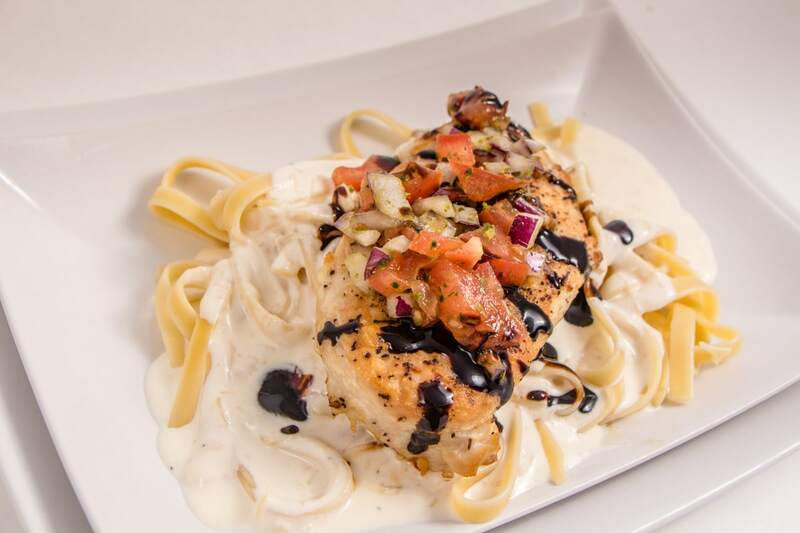 Your Bruschetta Chicken looks like what they would serve in hotels and restaurants. I am sure it will be a delightful recipe for meat lovers. Sounds yummy! I love meats seasoned with basils as they have a unique flavor. Thanks for including the recipe. Definitely saving this for later. Your video makes it looks so easy. Thank you for this! The good news is, it’s really as easy as the video makes it look. Even “Fancy” foods, can be made easily without losing the flavor. It’s a great recipe. This is simple yet looked very flavorful recipe! Quick and easy recipes are my favorite to make. Quick and Easy Recipes are my favorite too. 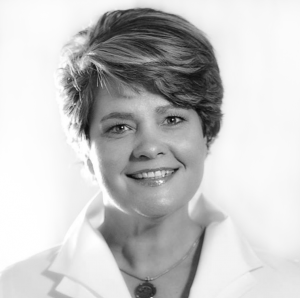 I hope you check out the rest of the website as it is filled with simple and flavorful recipes. This looks so easy and incredibly delicious! I can’t wait to try it for my family. It is as easy as it looks for sure! I hope you love it! This looks so yummy and delicious. Thanks for sharing with us. Drooling. Can’t wait to try this. Huge balsamic vinegar fan so this will be delicious ? Wow, this looks and sounds amazing. Thanks for sharing the recipe. I’ve been looking for new ways to good chicken. Oh my goodness this looks amazing! I love bruschetta chicken! I’m going to be bookmarking this blog post so I can make this for my family! I think they are going to love it! I was surprised how even my teen boys loved this recipe. And it’s so simple too! Let us know how your family likes it! We would love to hear.